Item Description: Diamond life. 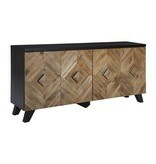 Make a bold, brilliant statement with this 4-door accent cabinet. 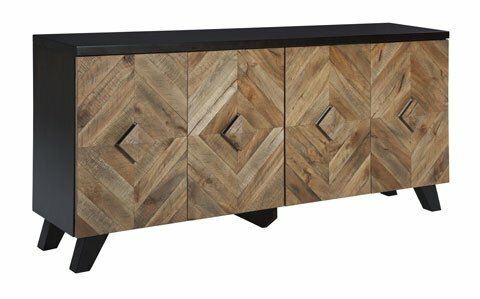 Its two-tone styling merges a dark brown exterior with a multi-tonal distressed finish on the doors and handles. 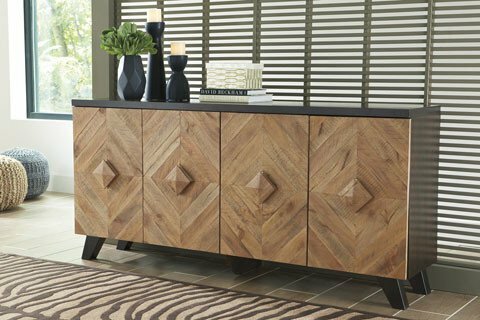 Diamond-shaped plank effect brings rich, dimensional flair to the scene. Adjustable shelving makes this high-end accent piece highly functional. Series Features: Accent Cabinet. 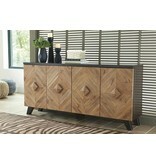 Constructed of Veneer and Solid Woods in Dark Brown and Light Brown Finishes. Wooden Door Pulls. Diamond Inlay Pattern Door Fronts. 4 Doors and 2 Adjustable Shelves.